Some people are natural hagglers, and find it rather easy to get people to adjust their pricing. They enjoy the challenge and want to be able to get the best deal possible, but for others this can feel uncomfortable and awkward. 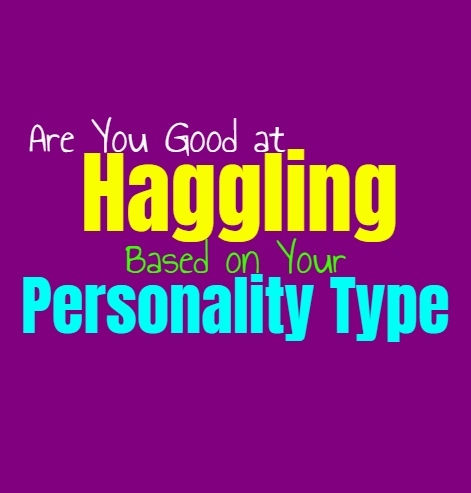 Here is how good you are at haggling, based on your personality type. INFJs actually can be good at haggling if they feel truly comfortable about the item they are bartering over. INFJs don’t usually like putting themselves in these types of positions but that does not mean they are incapable of it. If they feel like they need to haggle a bit in order to help someone they love or make the situation fair, then they certainly will. INFJs do believe in fairness and if they can haggle with someone to reach a reasonable price, then they are likely to be in favor of this. ENFJs are charming people which certainly helps them to convince others of things they want. When it comes to haggling they are often very capable of bringing down a price and getting things done. They aren’t usually afraid of haggling or finding a way to make the situation more fair, especially if it seems like the right choice. ENFJs are often rather outgoing people and so they become less afraid of communicating in this way, and are willing to give it a try. They are often very good at haggling since they are convincing and charming people. INFPs might not enjoy the idea of haggling since it feels a bit uncomfortable for them. Having to haggle someone down to a lower price might not feel entirely fair to them, and so they prefer when things are a set price. INFPs also don’t like being in a situation where they have the ask the price of something, and would rather it be clear so they don’t have to deal with this. While they are capable of being social people, in these settings it might feel a bit awkward. ENFPs are not afraid of haggling in the right situation, since they are outgoing people. They have a sense of charm which often helps them to obtain the things they want from people. If the ENFP feels like a price just isn’t right, then they aren’t afraid of haggling in order to make it fair. ENFPs do believe that things should he fair and so for them it is better to haggle than to simply accept a price that seems a bit unreasonable to them. ENFPs are often good at haggling and can often convince people of things rather easily. INTJs aren’t afraid of haggling if they have the opportunity to do, and will certainly take advantage of these situations. There are certain rules in place when it comes to haggling, and INTJs are often very aware of them. They know the situations where trying to haggle a price down is permitted, and in these situations they are certainly going to take advantage of the opportunity and do their best to remain firm. ENTJs are often great at haggling since they are firm with their price and can even be a bit intimidating. They are not afraid to stand their ground and often know exactly what the fair and acceptable pricing would be. ENTJs also know when it is appropriate to haggle and when they shouldn’t attempt this. Because of this they are comfortable trying to get the price down when it is permitted, and will do their best to haggle and remain confident in their abilities. INTPs are often more curious about the idea of haggling than actually participating in it. They can be rather good at most things they set their minds to though, and so they are capable of haggling when they decide to give it a try. They usually try and analyze a situation and learn about it quite a bit, and might even enjoy figuring out how to be good at haggling. INTPs can sometimes feel awkward in these situations but at the same time they can enjoy the challenge. ENTPs are often great at haggling, especially if they really set their minds to it. They are charismatic people who enjoy interacting with others in a more heated situation. For the ENTP debating is truly enjoyable, and haggling is not much different in this way. They like taking on a challenge and is certainly feels thrilling to discover just how capable they are of haggling with someone to come to a price which feels fair. ISTJs are certainly capable of haggling when they are in a situation where it is the prudent thing to do. They are often frugal people who believe in saving money where they can. They will certainly be willing to haggle in situations where it is accepted, and if the price just does not seem fair. The ISTJ can be good at haggling since they aren’t overly emotional people, and they won’t become worked up if things don’t go as expected. They can stand firm and are often willing to walk away if the price isn’t right. ESTJs are often good at haggling since they don’t allow themselves to become overly emotional about the situation. They also realize that sometimes haggling is necessary, since they are naturally practical people. They believe in being frugal and want to work to get the best price they can. ESTJs are also competitive and will want to be able to feel like they have won in some sense, and so they work hard to haggle efficiently. ISFJs don’t mind haggling when they feel like it is necessary, since they are often very practical people. ISFJs can certainly participate in haggling when they are in situations where it is common practice. They might become a bit uncomfortable though, especially if someone is trying to be unfair with the pricing. ISFJs don’t want to scam or steal from anyone, so they want to haggle to make the price fair for everyone involved. ESFJs might not mind haggling, especially since they are practical people. They enjoy interacting in these situations where haggling is accepted and appropriate. ESFJs are often good at figuring out where they should haggle and the best way to get someone’s price down a bit. They want to be fair but at the same time they don’t mind trying to score a good deal, especially if it impresses someone they love. ISTPs don’t mind haggling sometimes, since they enjoy challenging themselves to try new things. They are charming people who are willing to interact with others in these situations, as long as it seems fair. They don’t always feel the need to haggle and might not be in the mood to communicate with someone in this manner. At the same time ISTPs do enjoy debating and often haggling feels rather similar. ESTPs can definitely be good at haggling, since they are charismatic people. Their ability to connect with others and be social certainly helps them when they are trying to haggle. At the same time ESTPs can live very much in the present and so sometimes they get so caught up that they fail to really haggle appropriately. They mind find themselves wanting to be nice to someone and so they accept their price without really trying to haggle them down. ISFPs aren’t usually fans of haggling most of the time, and would prefer to purchase something which is already priced fairly. For them it is best to be around people who give a more acceptable and obvious price, rather than something unfair that they need to haggle down. ISFPs aren’t afraid of trying new things but sometimes things like haggling can feel a bit draining to them. They might not even want to ask the price on an item unless it is clearly marked for them. ESFPs certainly don’t mind haggling, and enjoy being able to challenge themselves to experience new things. If haggling is acceptable in a situation then they will certainly be capable of trying this in order to test their own abilities. They are naturally outgoing and charming people which helps the ESFP to haggle with someone and get them to bend a bit easier. Their ability to connect with people and be liked, is certainly something which aids them in these situations.